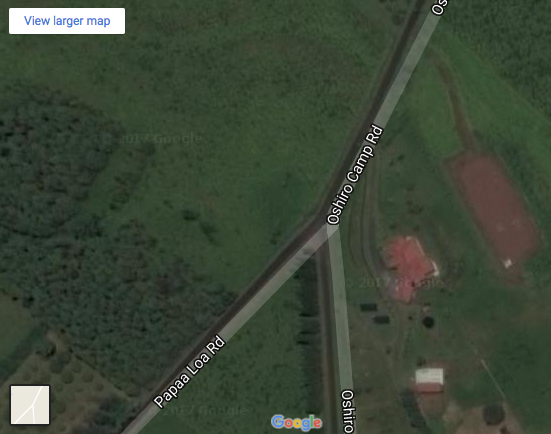 Google Maps view of Papaaloa Road and Oshiro Camp Road intersection where fire occurred on October 3. "Fire/Rescue crews responded to a 10:43 a.m. alarm Tuesday (Oct 3) to the Papaaloa Road and Oshiro Camp Road intersection for a brush fire in Laupahoehoe. Crews found a brushfire in vacant land buring 10-12 foot tall grass. The fire rapidly spread due to gusty trade winds at 25-35 mph. By 12:30 p.m. the fire was under control and had burned about 20 acres."